Trauma, also called physical trauma means physical injury, and in the case of amnesia it is to the head. For example, being hit by a car or a bad injury during a sport. When you get a strong blow to the head, it can cause concussion, which is a brief period of unconsciousness. In more severe instances, such as when they are a pedestrian struck by a car, the unconsciousness can last for weeks and months. As a result of the brain damage from trauma, postconcussional syndrome (PCS) can occur, which causes dizziness, nausea and blurred vision; and in the longer term: fatigue (feeling tired), anxiety, and depression. We call amnesia following trauma: post-traumatic amnesia, individuals are confused, not sure where they are, and will ask the same questions. Below is a study by Yarnell and Lynch (1970) on the effects of concussion. To investigate the effects of concussion on memory loss. A field study of American footballers who had been concussed during a game. After regaining consciousness, they were asked about the game just before the trauma. They were asked again between 3 and 20 minutes later. Accurate information was given immediately. Between 3 and 20 minutes later, no information could be given. The trauma has disrupted the process of forming a memory (consolidating a memory trace). It cannot be due to a failure in taking in the information in the first place because it could be recalled straight after regaining consciousness. 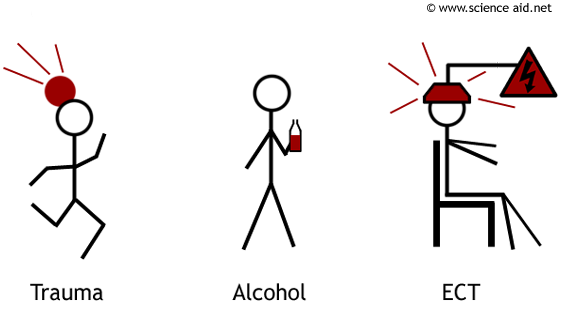 Drinking alcohol does not directly cause amnesia, and nor will getting drunk (at least not in a significant way). Amnesia can be caused in alcoholics because they derive most of their nutrition from drink and hence don't eat very much. This results in a Thiamine deficiency which causes Korsakoff's Syndrome, and of the many symptoms of this condition is retrograde and anterograde amnesia. Electron-convulsive therapy (ECT) is sometimes used (more often in the past) in treating depression. It works by passing 100 volts of electricity through the brain for a very short burst less than a second. It causes a seizure headaches and memory loss. Both retrograde and anterograde amnesia (mainly retrograde) occur, however in most cases this is only temporary. Friedburg (1977) found it takes 5 to 10 minutes after ECT to remember who you are, where you are and what day it is. And Brody (1944) gave the case of a woman who forgot how to cook familiar dishes following therapy; both are examples of retrograde amnesia. You may wonder why this treatment is used at all considering the side effects and the fact that nobody knows how ECT works (although it is thought to involve stimulating neurotransmitters in the brain). However, this treatment is only used when drug therapy has failed and the patients with severe depression will be willing to try it to get rid of the illness.